We're taking Scouting to a whole new level! Get ready for our new STEMovation Lab. This science, technology, engineering and math inspired portable training center features the latest educational tools to inspire our Scouts to be creative. 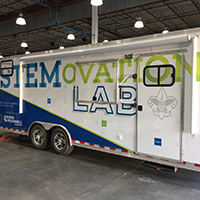 Inside our rolling laboratory, Scouts will encounter cutting edge programs like software development, system engineering, 3D printing, laser cutting and etching, video drones and much more! The STEMovation Lab is sponsored by the Burns & McDonnell Foundation. Learn more about the new STEMovation Lab and local STEM camping opportunities at STEMCamping.org.